Showy Lady's Slipper (Cypripedium reginae); photo by Kristin Maling on Flickr (noncommercial use permitted with attribution / no derivative works). Lady slippers (also called moccasin flower) can live up to 50 years but develop slowly, taking up to 16 years to produce their first flower. Since 1925 this rare wildflower has been protected by Minnesota state law (it is illegal to pick the flowers or to uproot or unearth the plants). Lady slippers are listed as threatened and endangered by many states. Quote from Minnesota Legislative Reference Library: "The Lady Slipper was considered the state flower long before it was officially passed into law. In 1893 a petition from the Women's Auxiliary to the World's Fair was presented to the Senate, asking that the Wild Lady Slipper (Cyprideum calceolous) be designated the state flower. The Senate adopted the resolution on February 4, 1893 ... but there is no evidence that the House adopted it. Also, the variety that was designated was not from Minnesota. In 1902 women of the St. Anthony Study Circle brought this to the attention of the Legislature. 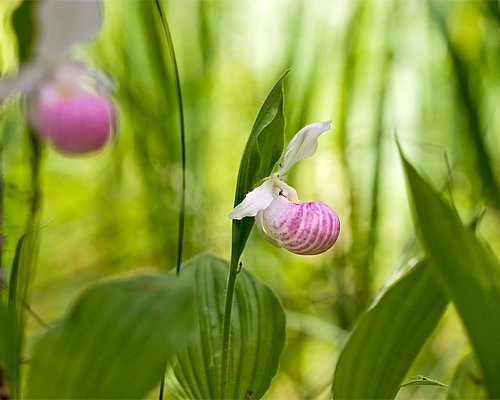 The Senate passed a new resolution on February 18, 1902, naming the pink and white lady slipper (Cypripedium reginae), also known as the showy lady slipper, as Minnesota’s state flower (Senate Journal entries). The House concurred (House Journal entry) ... the designation as official state symbol was written into law in 1967." 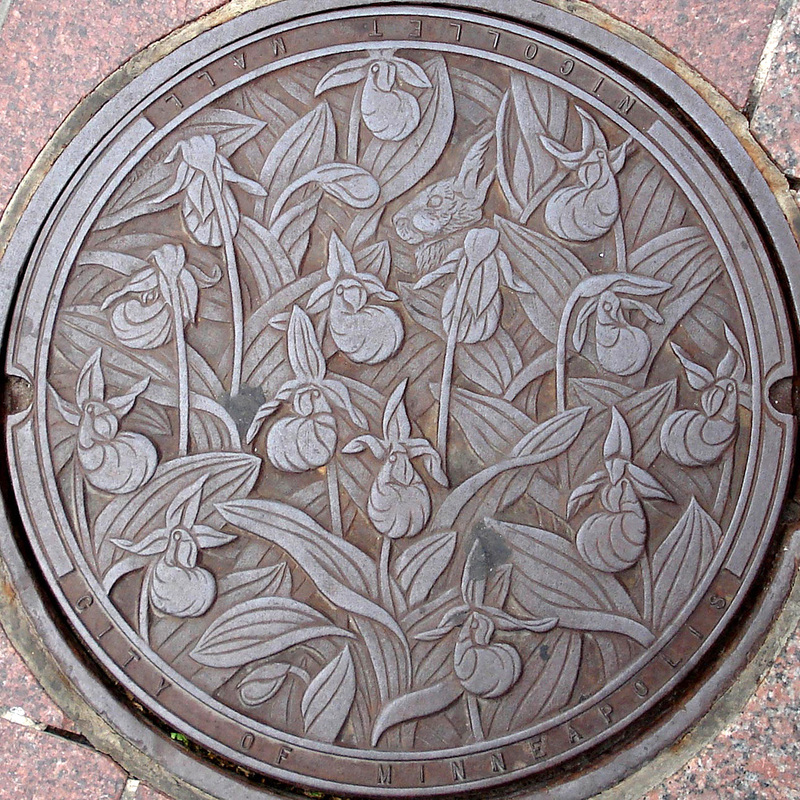 Lady slipper art in Minnesota: one of a series of eleven manhole covers in downtown Minneapolis designed by Kate Burke; photo by Tom Magliery on Flickr (noncommercial use permitted with attribution / share alike).